iPhone is one of the best and most popular phones around the world due to its design and operating system. Every improvement it makes can capture people’s attention. So does the upcoming iPhone 7. For iPhone owners, we play games, watch videos, record and work on our phones. Imagine when we make a video in MP4 format and want to share with friends, what shall we do? When we download a movie and want to watch it outdoors, what shall we do? Well, we need to put them into our iPhone so that we can share and watch those MP4 files. But how to transfer MP4 to iPhone? Here we will know some feasible ways. AirMore is a multi-functional application that could help you transfer and manage your phone data. As a web-based app, you do not need to upload your files to Cloud server first and download to your device or log in any account to transfer data. You just need to link your mobile device to the computer. Better yet, it offers more than one connection method. Different from most file transfer tools, this application works without cable, so you can get rid of USB problems. And you can copy MP4 to iPhone as well as Android phone. Go to App Store and search for this app. Download and install it on your mobile. Set network to make sure your iPhone and computer are in the same Wi-Fi. Open the application on the phone and visit AirMore Web on PC. Tap “Scan to connect” button and scan the code on the computer screen. Click “Videos” and then “Upload Files”. 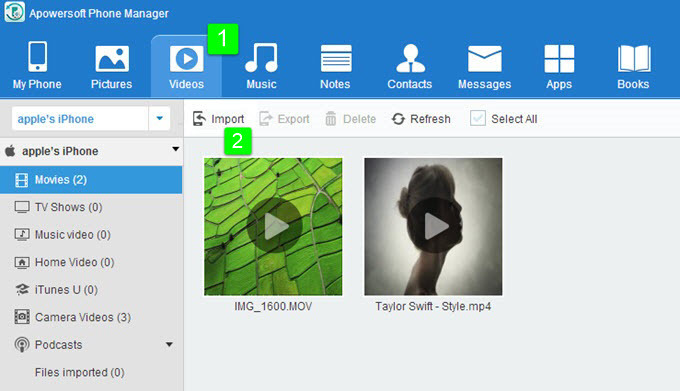 Choose MP4 files to transfer. 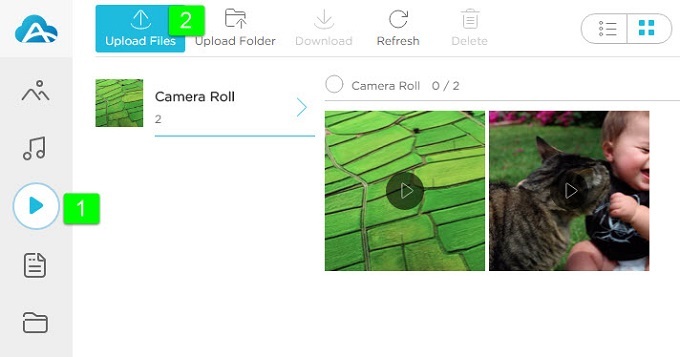 When the process completes, you will get your videos on your iPhone. Moreover, you can not only import MP4 to iPhone, but also transfer videos from iPhone to computer, which will help you save a lot of storage space. Download this software from the official website. Or you can get it by hitting the button below. Connect iPhone to PC via USB. Go to “Videos” tab and click “Import” to select and transfer MP4 to iPhone. This method works easily and also suits Android devices. If you connect devices with a cable, the transfer speed will not be affected by network. But this software can’t run on Mac yet. iTunes might be the first tool that Apple users encounter. You can put your movies, music as well as eBooks to your iOS devices with it. It can also work without network. Moreover, both Windows and Mac users can utilize iTunes on their computers and transfer media files between PC and iDevices. Now follow the guide to copy MP4 to iPhone. Link iPhone with the computer using a cable, and run iTunes. Open “Files” on the upper left corner and then “Add File to Library”. Select files and click “Open”. Go to device icon and tap “Movies” under “Settings”. 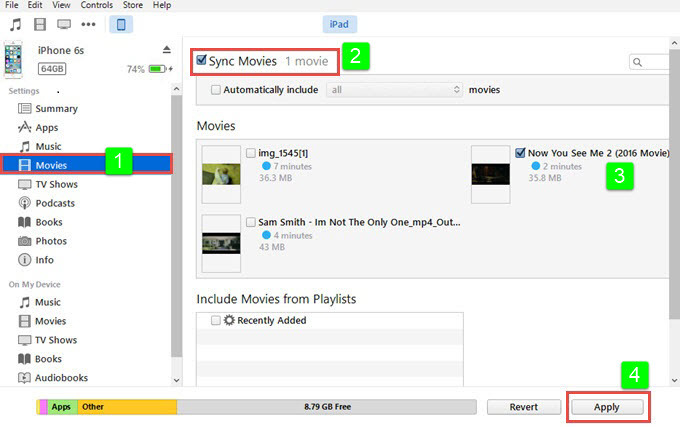 Check “Sync Movies”, choose items and click “Apply”. The methods mentioned above can easily help you. iTunes can only transfer files to iPhone while the others can do more than that. You can use them to manage and export data to PC. And AirMore is compatible with Mac and Windows computer. 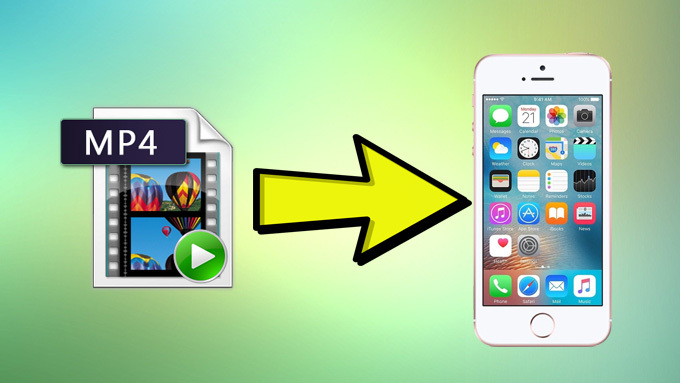 Now choose your favorite method to transfer MP4 to iPhone!